Back in Stock! This colored lens metal style is getting more popular as the season progresses. The trend is leaning more towards colored lenses as well as mirror lens. These are not mirror lens but they do have a colored blue tint, gradient smoke lens, and gradient brown lens. 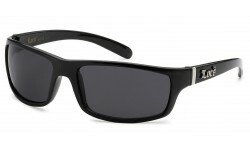 A must have for any sunglasses resellers.